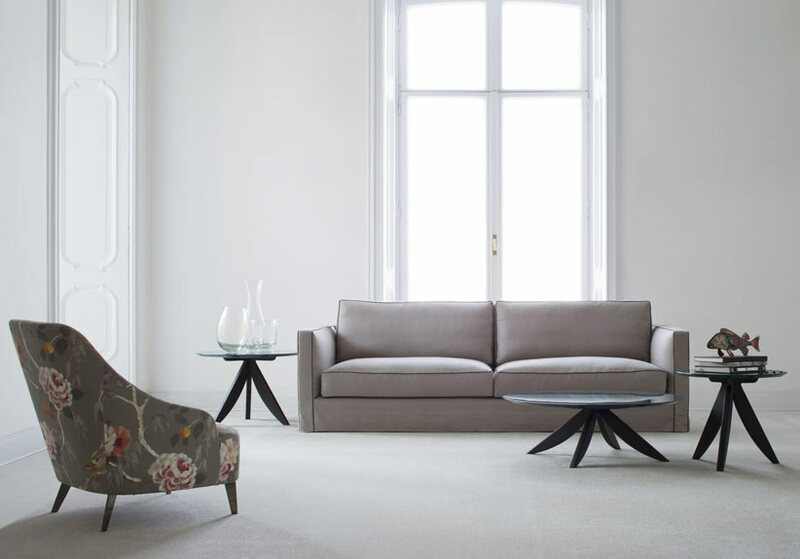 Danton is a modern sofa from the Berto Atelier Collection. The Danton sofa, presented here in linen and velvet, was the newest addition in 2015 in the Modern Sofa collection. Its modern tailored design and light volume is graceful, made from the highest quality materials, and sewn like an haute couture evening dress. The Danton velvet sofa is visibly lustrous and sophisticated, evidently made with great care and attention to given to every detail. The thin armrests frame the attractive and very cozy seat and back cushions, both made with a mix of goose down and polyurethane foam. 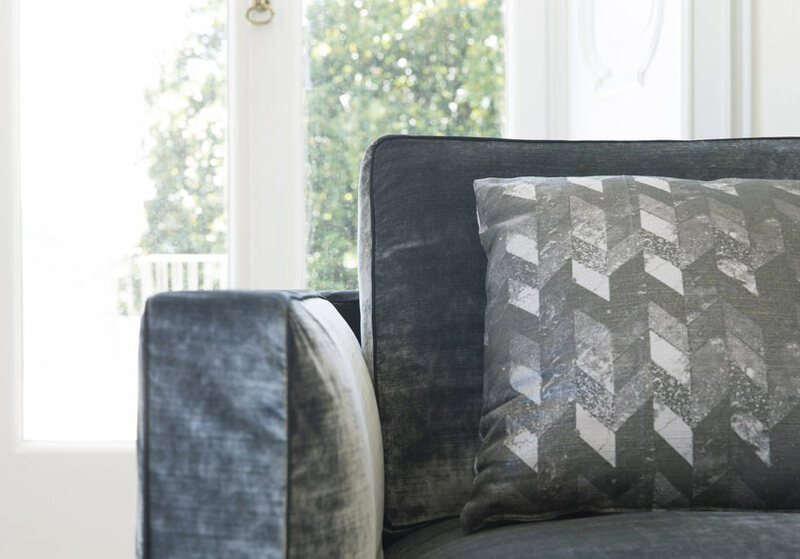 The sofa cover is cut and sewn like a couture gown designed to flow softly to the ground. Its innate elegance and simplicity makes it a favorite among decorators, combined with an unlimited selection of high quality fabrics and leather from the Berto Textile Collection, Danton is unmistakably distinctive. The Danton linen sofa fits well in many environments: it is soft to the touch and very comfortable, offering owner and guest unforgettable relaxation. The charm and elegance of a Danton velvet sofa clearly make it ideal for luxurious environments. Combine either with contrasting grosgrain piping it is adaptable in all types’ of coverings, from linen to velvet or in our Nubuck leather is unquestionably unique. Shown here with contrasting dark brown grosgrain piping, which illustrates its natural sleek silhouette, enchanting any environment, from contemporary to classic. 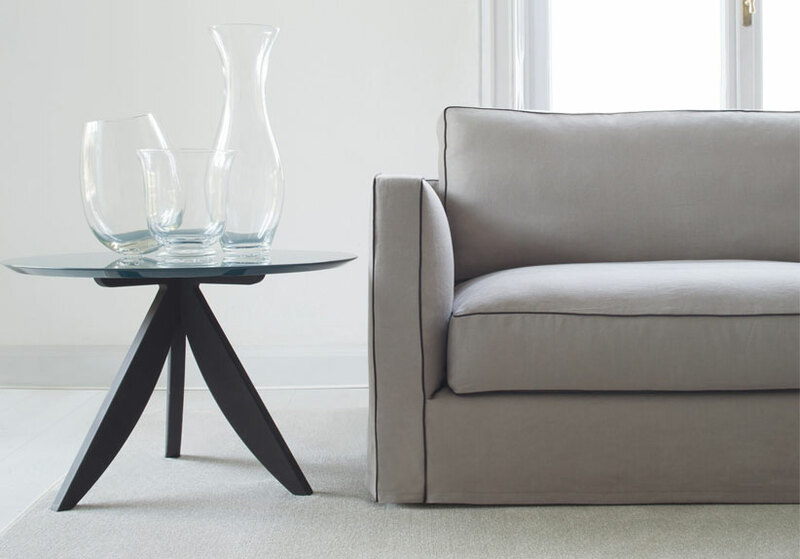 Danton, like all models in the BertO Atelier Collection is customizable: in size, tailoring details, in comfort, and is available in fabric or leather versions. Available in both versions in our showroom in Meda and Rome, and can be ordered made to measure on line.